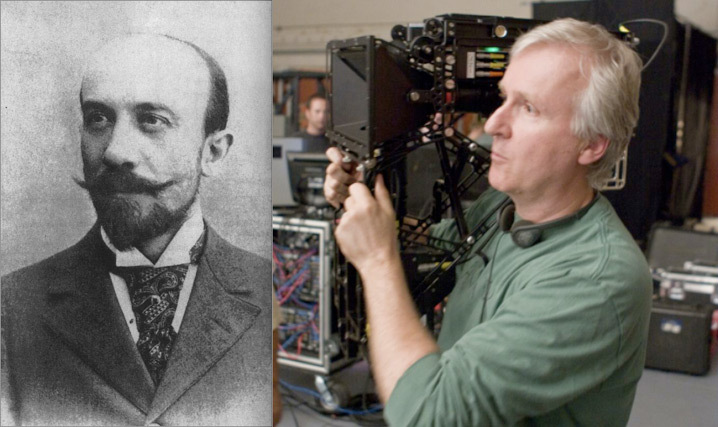 Above: Ninety-seven years after he retired from filmmaking and several decades after his rediscovery by historians, Georges Méliès (left) continues to be a relevant and emblematic figure. James Cameron (right) is an innovator at the center of the new digital form of making movies, but will he be remembered a hundred years from now? It started in mid-September, when the ballots for the Cinematheque Ontario's Best of the Decade (2000-2009) poll were due. Not long after, in November, the choices had been tallied, prints had been reserved for a retrospective series consisting of many of the top voted titles, and curator James Quandt had put together a nifty analysis of the results (fashioned much like J. Hoberman's year-end introductions for the Village Voice). Commentary followed, personal lists emerged—the decade seemed to be the inevitable talking point for the next several weeks. The decade...and Avatar, of course. The latter has inspired reverent summary pieces that attempt to tackle fundamental questions related to spectatorship and the future of digital technology. Manohla Dargis, joining the fray rather late, has thoughtfully invoked Edison and the year 1896, when the Vitascope was first introduced, to relate this phase of discovery in cinema to the experience of watching Avatar with a rapt audience in 2009. Both, she seems to suggest, created or are creating audience enchantment and a fierce climate of technological proprietorship: enchantment in the sense that Avatar's release is being hyped as a landmark that could very well be as important as the first Vitascope and Cinématographe projections; and proprietorship, in the way the success of the film signals new advances in technology, which big companies perfect and are able to license (digitally) now as Edison did (mechanically) over a hundred years ago. The enchantment of an art and the industry that disseminates and makes that same art possible: strange bedfellows. And yet, cinema is the same, a hundred years later, having been shaped by the same decisive factors. It's already 2010 as I start to write this, roughly a hundred years after Griffith started making films for Biograph, and in retrospect it seems perfectly reasonable that one should be eager not only to want to share what he has learned from another decade in cinema, but also to predict where things are headed. The most obvious strategy, then, would be to attempt to encapsulate the most recent trends in the wide world of film (certainly much wider than in 1910, a period when only three countries around the globe could reasonably be called filmmaking hubs). In reality, it helps to cast one's net wider—a lot wider—as a way to give greater historical nuance to what's right in front of you. One can safely assert, in the time since they started, that some of the most important figures of the late 19th and early 20th centuries were D.W. Griffith, Edwin S. Porter, Charles Pathé, and Georges Méliès. This is inarguable. Similarly, a look at the late 20th and early 21st centuries a hundred years from now will perhaps yield the names Apichatpong Weerasethakul, John Lasseter, Pedro Costa, and James Cameron. However, such pronouncements boil down to nothing more than hyperbole if one considers how cinema started and where it has wound up. To say that Méliès would be remembered a hundred years from now in 1910 would be a radical thought indeed. And as Richard Abel has aptly detailed, the Lumière brothers were so firm in their conviction that cinema was a passing fad that they stopped producing their own films after only a few years in the business. The examples go on. Fast-foward to the present and the sentiment behind the musings of an overwhelming number of critics seems to be that James Cameron, for example, is one the greatest and most important filmmakers ever. How does one know? What are the reasons for only focusing on the technological breakthroughs of figures like Lasseter and Cameron, and the artistic advances of Weerasethakul and Costa? Dargis provides an exception rather than the rule here in expanding the discussion. A helpful hint may lie in the fact that critics nowadays—whether talking about Avatar or any other film—are fearful of alienating younger generations who regard old films as relics. There are hardly any commentators who have attempted to steer the discussion, productively, to the pre-2000's in these polls or "think" pieces. (David Bordwell and Kristin Thompson, in addition to Dargis, are another singular example, discussing the best films from ninety years ago for three consecutive years on their blog.) Perhaps the enormous gap between Cameron and Costa, to make one comparison, wouldn't be so exasperating if spectators were better versed in films made before Star Wars and Raiders of the Lost Ark. To say that there weren't blockbusters before these films is a mistake that somehow lives on in mainstream criticism. Outside of critics' circles, what does it say that the majority of film festivals choose to show dozens of mediocre contemporary films but almost never project older works? Or that the repertory and archival divisions of the major studios continue to let their holdings go to waste by refusing to strike new prints or engage in restoration activities? The curator and museum director Alexander Horwath has argued that this attitude ethically violates a corporation's responsibility to history and the community. Critics and their editors seem to be following step by treating studios' latest, biggest products with front-page headlines and feature reviews, whereas articles on revivals are relegated to capsule summaries at best. To those of us in a growing minority who spend most of our free time in either repertory screening houses or at home watching DVDs of older films, the insistence on the new is a numbing and ultimately disappointing mind-set. On the bright side, the cinephile of today and tomorrow has all the tools he needs to assume a posture of activism on the internet and in the places where people care about such things, such as alternative screening spaces, libraries and schools. In my hometown of Chicago, there are several individuals and groups doing exactly that. Partly as a symbolic gesture, partly as a historical survey intended to study canonical shifts, I have initiated a counter-thrust to the deluge of commentary on the last decade by asking a coterie of friends and experts in the field to submit their ten (or more) best films from the years 1899-1909, and to include a figure of the decade. If they couldn't think of ten, I asked them to submit five. Some nominated an important person; others opted not to. Why 1899 to 1909? A more appropriate delineation would have been the best films of 1895—date of the first Lumière projection—to 1914—year of both the start of World War I in Europe and Griffith's filming of a recreation of the American Civil War in The Birth of a Nation (1915). However, 1899-1909 represents a round decade, much like 2000-2009 (which is just as arbitrary a time bracket if one wants to catalogue world cinema tendencies), leaving at least one year (1899-1900) as a safety zone for uncertain release dates. In any case, I elected to leave in any titles that were included for one reason or another (some explained, others not) outside of the permissible range. As you'll see from their serious commitment to this survey, the folks below do not regard these films as museumified objects, but rather, living artworks that contain in them a fascinating challenge to our changing artistic sensibilities and consumptive habits. The question of whether cinema—not film, as in nitrate or acetate or polyester cellulose—is dead is an interesting polemic, but if one considers the reality of filmmaking as industry, moving images should endure at least another hundred years, easily. In this first installment to the "Best of the Decade...One Hundred Years Ago" project, I present the individual lists of the seventeen participants. 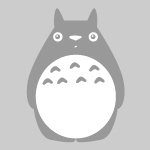 To see a tally of the most cited films (with links to YouTube versions of all but one of the titles), scroll to the very bottom. Check in next week for observations on the submitted lists, my own choices of the decade's ten best, and further notes. Comments: There are two possibilities for such a list: to spend a week or two on it, or to do it spontaneously and in 10 minutes—which was my solution, otherwise I wouldn't have done it. And the prize was that I went into 12 titles, as I don't now have time to ponder about two eliminations among so many brilliant small films. Comments: As your decade counts eleven years, I took the liberty of going somewhat beyond the prescribed ten titles. It is not a specialist's list, but a subjective one, that might change – hopefully – according to future curiosities and discoveries, especially from other countries. So there are few trick films (sorry about Segundo de Chomón), few comedies, no British or Italian at all -- one has to be unfair, those will be for next time -- maybe. One film to one director (while being unfair to producers), since Griffith's output clearly opens up a new era and would warrant no less than three titles. Circuito de São Gonçalo (Paulino Botelho, 1909) - It's the oldest Brazilian movie that survived and the film that captured the first car race in Brazil. The person of the decade is Charles Pathé—he transforms a little business into an industry. And the figure already by 1909 would be the lately much-maligned David Wark Griffith, who, whatever his shortcomings, continues to be one of the greatest filmmakers ever. Comments: Porter's Fireside Reminiscences is not selected because it's a great film, per se, but because it's the earliest instance I know of a film that proposes cinema itself as a predominant means of understanding and interpreting modern life. Reminiscences is no coy self-reflexive exercise; as the old man sits in his crusty den and watches the images of his life projected above his fireplace--the first home theater!--he discovers that experience and memory are not enough. Things must be seen. Great article and I’m very interested in seeing many of the films listed. I wish early films weren’t regarded as things solely to be analyzed and studied, many of them are beautiful to watch. Is it me or does Porter get somewhat short shrift here? No UNCLE JOSH, no WINDY CORNER, no GHETTO FISH MARKET? Otherwise though, a fabulous endeavor, and fascinating results from an esteemed panel: I’m saving these lists in hopes of broadening my own, and my students’, early film horizons in the months to come!